The sea turtle body plan, or design, has changed very little over the past 100 million years, suggesting that it is hard to improve upon perfection since their streamlined design works so well in the sea and no modifications are needed. Their hard shell protects them from predators and allows them to dive deep. Learn more about the names used by scientists to describe sea turtle anatomy useful in species identification. Each sea turtle has a characteristic carapace which can be used in species ID. ​Not labeled in this diagram, these run along the edge of the carapace. Counting these will help you identify the species. These are the scales between the eyes and used in species ID. Please note on the body are scutes and on the head are scales. The belly or the underside of the turtle. The pattern made by scutes on the turtles shell, or carapace, are used to quickly identify a sea turtles when observed at sea. 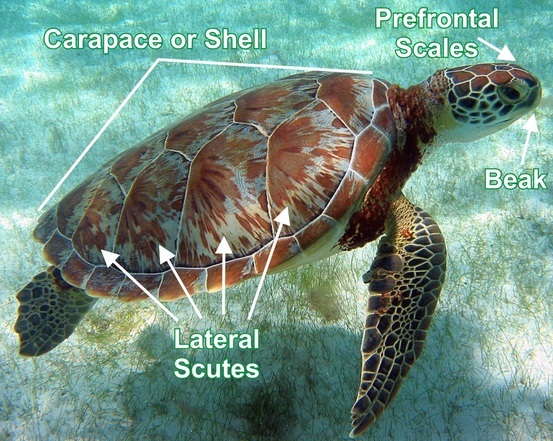 The number of scutes and the patterns they form are used to identify sea turtles. Injuries can be described by their location. The prefrontal scales are used to identify species of sea turtles. Pictured here is only one pair, indicating this is a green sea turtle.